PARIS — More than a decade before the international agency that monitors chemical weapons won the Nobel Peace Prize, John R. Bolton marched into the office of its boss to inform him that he would be fired. Mr. Bolton, then an under secretary of state and later the American ambassador to the United Nations, told Mr. Bustani that the Bush administration was unhappy with his management style. But Mr. Bustani, 68, who had been re-elected unanimously just 11 months earlier, refused, and weeks later, on April 22, 2002, he was ousted in a special session of the 145-nation chemical weapons watchdog. The story behind his ouster has been the subject of interpretation and speculation for years, and Mr. Bustani, a Brazilian diplomat, has kept a low profile since then. But with the agency thrust into the spotlight with news of the Nobel Prize last week, Mr. Bustani agreed to discuss what he said was the real reason: the Bush administration’s fear that chemical weapons inspections in Iraq would conflict with Washington’s rationale for invading it. Several officials involved in the events, some speaking publicly about them for the first time, confirmed his account. Mr. Bolton insists that Mr. Bustani was ousted for incompetence. In a telephone interview on Friday, he confirmed that he had confronted Mr. Bustani. “I told him if he left voluntarily we would give him a gracious and dignified exit,” he said. As Mr. Bustani tells the story, the campaign against him began in late 2001, after Iraq and Libya had indicated that they wanted to join the Chemical Weapons Convention, the international treaty that the watchdog agency oversees. To join, countries have to provide a list of stockpiles and agree to the inspection and destruction of weapons, as Syria did last month after applying. Inspectors from the agency were making plans to visit Iraq in late January 2002, he said. “We had a lot of discussions because we knew it would be difficult,” Mr. Bustani, who is now Brazil’s ambassador to France, said Friday in his embassy office in Paris. The plans, which he had conveyed to a number of countries, “caused an uproar in Washington,” he said. Soon, he was receiving warnings from American and other diplomats. Mr. Bolton called on Mr. Bustani a second time. 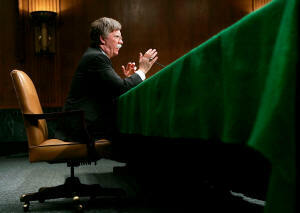 “I tried to persuade him not to put the organization through the vote,” Mr. Bolton said. But still Mr. Bustani refused, and his fate was sealed. The United States had marshaled its allies, and at an extraordinary session, Mr. Bustani was ousted by a vote of 48 to 7, with 43 abstentions. He was reportedly the first head of an international organization to be pushed out of office this way, and some diplomats said the pressure campaign had made them uneasy. Mr. Bolton’s office had also circulated a document that accused Mr. Bustani of abrasive conduct and taking “ill-considered initiatives” without consulting with the United States and other member nations, diplomats said. But diplomats in The Hague said officials in Washington had circulated a document saying that the chemical weapons watchdog under Mr. Bustani was seeking an “inappropriate role in Iraq,” which was really a matter for the United Nations Security Council. Avis Bohlen, a career diplomat who served as Mr. Bolton’s deputy before her retirement, said in a telephone interview from Washington on Saturday that others besides Mr. Bolton believed that Mr. Bustani had “stepped over some lines” in connection with Iraq and other matters. “The episode was very unpleasant for all concerned,” she said. 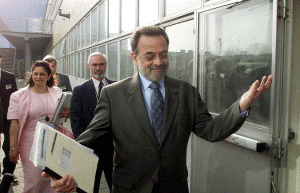 Speaking from São Paulo, Brazil, on Saturday, Celso Lafer, the former Brazilian foreign minister, said that in early 2002, he was asked to meet privately with Secretary of State Colin L. Powell, who a year earlier had praised Mr. Bustani’s leadership in a letter. Getting Mr. Bustani fired took some doing. Washington failed to obtain a no-confidence motion from the chemical weapons watchdog’s executive council. Then the United States, which was responsible for 22 percent of the agency’s budget at the time, threatened to cut off its financing and warned that several other countries, including Japan, would follow suit, diplomats have said. Mr. Bustani recalled that the ambassador from Britain, one of the agency’s most committed member nations, told him that London had sent instructions to vote with Washington. With the United States and Japan covering almost half the budget, the organization ran the risk of collapsing, Mr. Bustani said. He reflected on the contrast between Iraq and Syria. Inspectors from the agency are there now, cataloging the government’s stockpiles of chemical weapons as a step forward in Syria’s civil war, now in its third year.